If you thought Xperia Z is amazing, but could make do without the waterproof part of it, Sony's got you covered, as it introduced the Xperia ZL sibling, with an even more compact design. With its 5.18" x 2.74" x 0.38", it is shorter than the Z, and a soft-touch curved back nestles it comfortably in your palm grip. The microSIM and microSD slots are situated under a large flap at the back bottom, and the phone is graced with a dedicated shutter key, unlike the glassy, watertight Z.
Specswise it is identical - a 5" Full HD screen with Mobile BRAVIA Engine 2, and the typical for the tech weak viewing angles, a quad-core Snapdragon S4 Pro, and a 13 MP rear cam with HDR video capabilities. The funky part here is not only the circular power/lock key on the right, but also the front-facing camera, which is situated in the lower right corner of the phone, where you are used to find one of the Android navigational keys, which here are on-screen. Besides the shape and size, there is a slight difference in battery capacity between the two - the ZL has a sealed 2,370 mAh unit, which is a tad bigger than the one in the Z. The long-rumored IR blaster is indeed here, with the accompanying app that allows you to use the phone as a remote control for a wide variety of TVs, home stereos and other assorted electronics around the house. The Xperia ZL is promised to arrive for as soon as this quarter, which will make it the first brand name flagship for the year. There is a full suite of baseband radios for LTE and HSPA+ networks, but in what "select markets" and on which carriers the ZL will land is still to be announced, same as the price. this is definitely the more interesting one of the two. i imagine the idea with the FFC is that the phone is meant to be used in Landscape when making use of the camera. SIMPLY LOVELY. 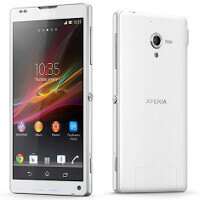 I can't wait to replace my Atrix 4G for the XPERIA Z. ZL will be will be the in other markets. any word on the carrier? till March or Feb TheSuperiousMan. probably have to wait till MWC 13'. I'm dying to buy this right now. Cause this is a design like no others, like SONY says. S3 and S4 is and will be ugly, even I love the design of the S2. Have to say this phone looks great and it has a larger screen than the s3 in a smaller chassis than the s3 which is great.. But as usual don't trust Sony especially after how terrible experience my brother had had With the xperia s and also the shockingly slow updates Sony do..example the xperia s was supposed to be there 2012 flagship and isn't even close to getting jb...its been 6 month already and the supposedly 2012 flagship device won't see it till the end of q1 2013 which is then going to be 10 months too late as by then that sh## phone will be gone... Funny thing is people say that Samsung are rubbish at updates but at least they support there top ends I mean I've running jb for ages... As much as I think this phone looks great I will wait for the s4 as I know it will get frequent updates and will have awesome xda support... not hating as I said I love the look and spec of this phone but seeing how much my brother hates the xperia s and the lack of support its had I can't spend £500 on one of there device. I'm in love again, oh shiiiit i guess i'll be sleeping in the garage for the coming week. waterproof is useful though, I cant remember how many times i have to hide under a roof to use my phone in the middle of the rain.